It’s happened again: the Broadcast Consortium has determined that Green Party Leader Elizabeth May should not be invited to the televised Leader’s debates. This was the same decision that the Consortium initially came to back in the early days of the 2008 election. Back in 2008, a public outcry swept the nation, with Canadians demanding that, for the sake of democracy, May should be able to participate in the debates. The Consortium changed its mind, and May was given the opportunity to participate. So, what’s changed since 2008? Well, almost one million voters (totally 6.7% of voting Canadians) cast their ballots for the Green Party in the 2008 election. This was up from the 4.2% the Green Party earned in the 2006 election. In 2008, the Green Party was the only party to actually increase the total number of votes it received since the 2006 election. So, what’s changed is that more Canadians have actually cast ballots for the Green Party, both percentage-wise and in total. Yet the Broadcast Consortium chose to ignore this. 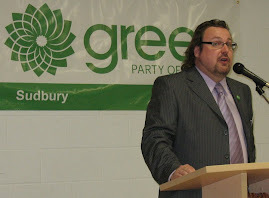 What’s changed since 2008 is that the Green Party has been polling at around 10% in many of the major polls which prompt for Party preference (which is an important reminder for voters – and likely more representative of the will of voters, too, given that ballots always list the Party’s name beside candidates). Admittedly, 10% is a rough estimate based on a number of different polls which use different polling methodology, but it’s the best that we’ve got right now. Only on election day will we know for sure what a true measure of Green support will be. 10%, though, represents 1 in 10 Canadians, yet the Broadcast Consortium chose to ignore this. More importantly, what hasn’t changed since 2008 is that poll after poll continues to show that around 70% of Canadians believe that Elizabeth May should be participating in the televised leader’s debates. It’s not that 70% of Canadians are going to suddenly vote for the Green Party. No, those Canadians are concerned about the health of our democracy, and they understand that when voices are arbitrarily excluded from democratic discourse, the health of our democracy suffers. In essence, the Broadcast Consortium as taken the opportunity for Canadians to find out more about the Green Party away from Canadians through a process which is arbitrary and without transparency. And that’s another thing which hasn’t changed since 2008. Today, Jack Layton, Leader of the NDP, called upon the Broadcast Consortium to justify it’s decision, and to set clear and transparent rules (presumably in consultation with would-be participants) regarding which Party Leaders have the opportunity to be heard over our public airwaves. Back in 2008, there were no rules in place, and in 2011, this remains the situation. Backroom deals between high-powered and well-paid executives are made, and the results are that Canadian democracy suffers. Remember that this election is happening because a majority of our elected officials found the ruling government to be in contempt of parliament. This loss of confidence in the government’s democratic ethics brought down the House, and was the immediate cause of the election. It’s not as if the NDP and Liberals really believed that they had a lot to gain by forcing an election based on recent polls, because all of the polls have shown the Conservative Party heading towards false majority territory. We’re having this election because Michael Ignatieff and the Liberal Party and Jack Layton’s New Democrats took a principled stand to bring down the government for the sake of democracy. And just 5 days into the election, we witness the faceless Broadcast Consortium making a decision to exclude the leader of a political party running candidates in each and every of Canada’s 308 ridings from participating in the televised debates. As much as some bloggers and anonymous posters would want to have you believe that the Green Party is a fringe party no different from the Pirate Party or the Family Coalition Party, the facts speak otherwise. While it remains true that the Green Party has never elected a member of parliament, what is indisputable is that the Green Party runs candidates throughout the nation (unlike the other smaller parties) and has achieved electoral results of hundreds of thousands of votes. Yet, the Broadcast Consortium chooses to ignore this. And it’s not that the Green Party is a regionally-based party which runs candidates only in one part of the nation. If the Green Party were such a party, maybe it would make sense to exclude their leader from the televised debate (although I would disagree that a successful regional party should be excluded). But wait just a moment – of course the Bloc Quebecois is just such a party, yet Gilles Duceppe, the Bloc’s Leader, gets an invite even though his party is running candidates only in the Province of Quebec! Some say that the televised debates are growing increasingly irrelevant in elections anyway, so the exclusion of Elizabeth May from being able to participate isn’t such a big deal. I don’t agree. Our televised political debates are watched on TV by a significant number of Canadians, and while the debates are but one piece of information which will assist in informing voters on how to cast their ballots, the debates are a very accessible way for Canadians to obtain information about the parties and their leaders. In short, if May were at the debate, she’d be talking about the Green Party to voters; if she’s not there, no one will be talking to voters about the Green Party, which will have a candidate on each and every ballot on which a voter is asked to mark. TV and the mainstream media remains a very influential way of sharing ideas. The media isn’t perfect by any means. Yet, when it goes out of its way to exclude information which might be cogent to Canadians, there’s something not right. It’s as if the media has decided which voices were relevant, and which aren’t. It’s almost as if they’re saying that if you don’t support one of the 4 parties which had previously elected MP’s to the House, you are somehow irrelevant as well. That’s the message being given to almost 1 in 10 Canadians, many of whom could be members of your family, your neighbours or co-workers. People that you value and respect. Why doesn’t the Broadcast Consortium value and respect these Canadians as well? Many of the people who read my blog will never vote for the Green Party of Canada, and that’s just fine with me. There may come a day when I won’t vote for the Green Party either, but I’ll tell you this much: our democratic values are slowly being eroded. In part, this election was called because of that erosion. The fewer voices which can be heard by Canadians through the mainstream media mean that there will be fewer choices for Canadians about where we want our nation to take our nation’s future. Whether voices turned off during an election, or they are drowned out by name-calling and personal attacks, the loss of these voices in the public realm is detrimental to our democracy. One thing which has changed since 2008 is the Green Party did not have any MP’s in the House of Commons at the time parliament was dissolved. Days before Stephen Harper broke his own fixed election date law by dissolving parliament, some may remember that Blair Wilson, a British Columbia MP, had indicated his intent to sit no longer as and Independent, but as a Green. Wilson never did get the opportunity to actually sit as a Green, but some have suggested that since the intention for him to do so was there, the situation in 2008 was different from today’s situation. I partly agree with that assessment, but I believe it’s a complete red herring, because it doesn’t change the fact that there are no set rules for which the Consortium has applied to its star-chamber decision making process. If there were a rule that said that a Party must have an MP in the House to participate in the debate, that would be fine, and clearly the Green Party wouldn’t qualify, and you wouldn’t have the sort of online democratic uprising that we’re experiencing now on our hands. When decisions which affect Canadians are made without criteria, in backrooms, without consultation, and based on arbitrary values, it’s no wonder that Canadians get upset. What happened last night with the Broadcast Consortium’s decision wasn’t just about the Green Party. It was about Canada and our democratic processes. In the long run, it might not even affect the Green Party or the outcome of this election, on the one hand. But this decision is sure to affect the way in which our democratic values continue to be eroded, bit by bit, until there comes a time when we look at the Canada that we have and can no longer recognize it. Fail. Wherever possible in the Occident, the globalist patsy Greens must be thwarted. Ms. May will finally bring down this pretender in a ball of self-righteous flame. There will be selective, though not many, pieces to pick up. Where it is rotten kick it. The Consortium is the oddest of allies for eco-political purists. The enemy of my enemy is my friend. Do you not contradict yourself here? "I personally don't believe that the Bloc deserves to have a seat at the table but they do represent a fair portion of Canadians in the ridings they have won so they do have a right to be there." IMO, under the current rules, "deserve" = "right." The problem is not that there is a full-blown, federal secessionist party in existence. The problem is that the secessionist sentiment and related politiking is limited to Quebec. Had Greens not thrown their core principles of bioregionalism and decentralization under the bus with the founding of the GPC in 1985, then provincial/regional parties could easily have run with such a mandate. As is, true eco-politics in Kanada was betrayed and died on the day that the GPC was founded. That it is an impossibility to introduce "Green" institutions at a federal/national level is a blind spot for Greens is beyond comprehension. But then again, I would not give the benefit of the doubt to the last couple of generations of "Greens" that they really know what is at stake. Actually I did no contradict my self in the case of the bloc where I don't believe a separatist party should be in the debates but since they have elected MP's then they can join that discussion. For the greens, the litmus test should be the same, get an MP elected, then go join the debating party. The Greens have essentially run a provincial/regional party as the Leader of the Greens seems to refuse to leave her new "hometown" during the campaign and is determined to win the BC riding. What will she do if she does not win that seat? I'm willing to bet money that she moves to another riding to try it again. The only problem is with the popular vote running in the mid 3%'s, she may have $1M less to work with. Interesting, Elizabeth May has no sitting representatives in Canada but another leader has no sitting representatives in MOST of Canada save one provinces which is a minority group in the makeup of the whole country!! Well Wayne, it would be no different if May was to win her riding and have 1 riding out of 308 in some small city in BC. Last I checked, QC is the second largest province in Canada. Arguably "more" representative of Canadians than BC due to the higher population. Either way it's a moot point since she is not invited and the debate moves on.